I don’t usually follow any pattern exactly, but this one seemed perfect the way it was, even down to the colours shown. 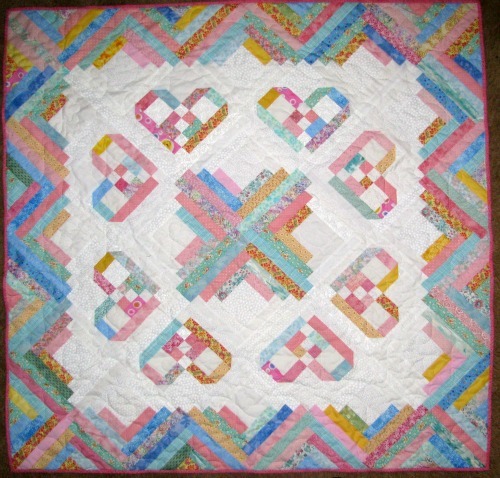 I did rotate my heart blocks so that they all pointed to the centre of the quilt, and I used coloured centre squares for the half blocks around the edge, but otherwise the quilt is just like the one in the book. My stash of pastel scraps is (slightly) smaller, and the quilt is on its way to its new home. It is eye catching! Love the colours. 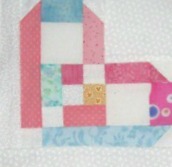 Have to make a baby quilt for a February baby so might try one like this. Beautifully done. Love those soft pastels.